According to the article below, the bitter conflict pitting Coke workers against The Coca-Cola Co. and its bottlers in Pakistan has been, at least for now, resolved. Excerpts from "The Pause that Represses: Coca-Cola Pakistan Greets New Union with Death Threats, Abduction, Extortion and Dismissals"
Since forming a union at Coca-Cola's bottling plant in the southern Pakistan city of Multan in June 2009, members have met with death threats, abduction, firings, extortion, forgery and fraud. Management's vicious response to the workers' fight for a union is a story drenched with violence, corruption, sleaze and escalating criminality. May 20, 2010, union rally calls for labour laws to be implemented and respected by management. 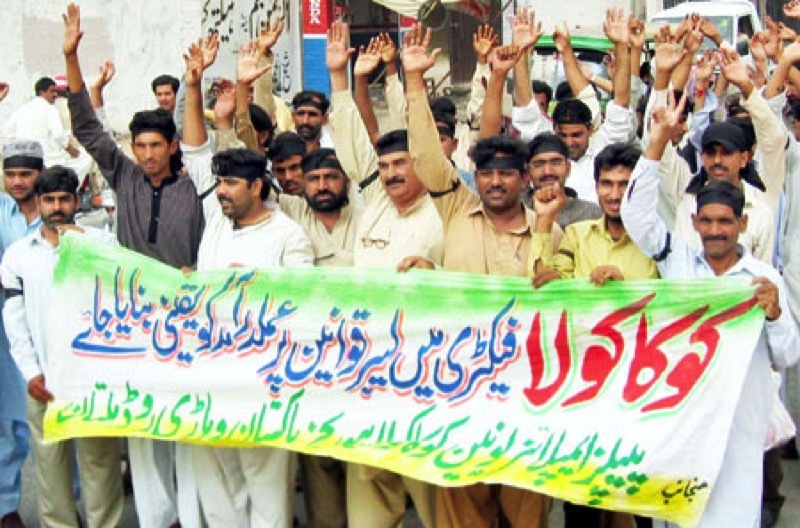 Management's response to union organizing in Multan was immediately hostile. As the union prepared for its founding congress on June 19, 2009, management began a campaign of blackmail and extortion targeting the 36 sales and merchandizing officers (SMOs) at the plant identified as active union supporters. On June 8 all SMOs were ordered to sign stamped, blank legal documents (the type used for affidavits or confessions) and to hand over signed blank personal checks. Those who refused this clearly illegal order were ordered to stay in the plant and barred from their sales routes - resulting in lost sales commissions amounting to a third of their monthly income. For 20 days SMOs were harassed into handing over these checks illegally. Four who refused were ultimately dismissed, together with three "temporary" workers directly employed at the plant, all of them strong union supporter. To further block any possibility of the workers winning legal recognition of their union, management set up its own 'union', called the "Workers Welfare (Mazdoor) Union". Through a combination of bribery and threats, CCBPL Multan management secured registration of their fake union on August 13. In addition to the 7 union members dismissed in the early stages of the union struggle, management last year dismissed 20 other direct Multan employees who were active union members. The termination letters were issued by 'Muhammad Saeed Awan Labour Contractor' despite the fact that these workers were directly recruited by CCBPL, and had never received payment from, heard of or ever seen Saeed Awan or any representative at any time during their employment at CCBPL Multan. 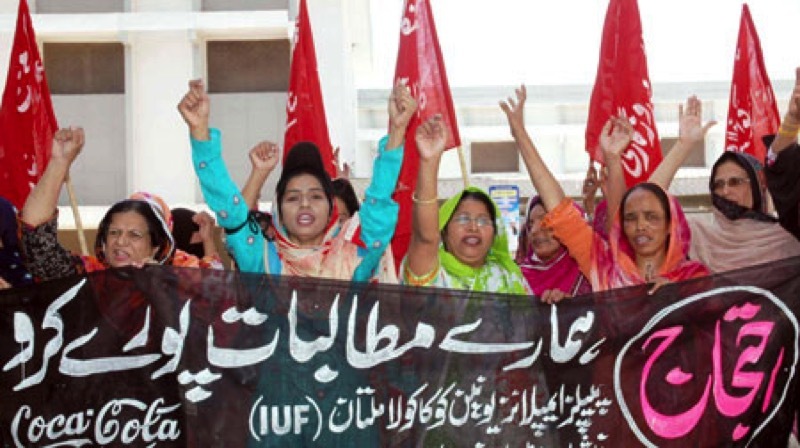 Women Workers' Federation rally in support of the Multan Coke workers. Through crude forgery of official documents and massive fraud, management is attempting to establish the fiction that union members at CCBPL are not in fact employed by the company where they have many years of service. This of course would exclude them from any collective bargaining relationship with Coca-Cola ...if Saeed Awan Labour Contractor really existed. However, if it did then CCB PL would be guilty of even more crimes under Pakistan law, since there is no legal provision for a "recruitment agency" which leaves workers with the status of "contract worker" not directly employed by the user enterprise. Excerpts from "Pakistan: What has Coke got to hide?" Any IFC loan is subject to an assessment under IFC social and environmental "performance standards" addressing the applicant's social and environmental record and the project's likely impact. A formal challenge can be made based on these standards.